September's Partizan saw a larger than normal gathering of the clans at our traditional watering hole of the Dovecote on the A46. Thirteen of us had a rather boozy supper with relentless teasing of various victims orchestrated chiefly by David Imrie I think! Once he's got you in his sights he shows no mercy! We all went off to the show at 0815 reinforced by one of Harry's hearty breakfasts. 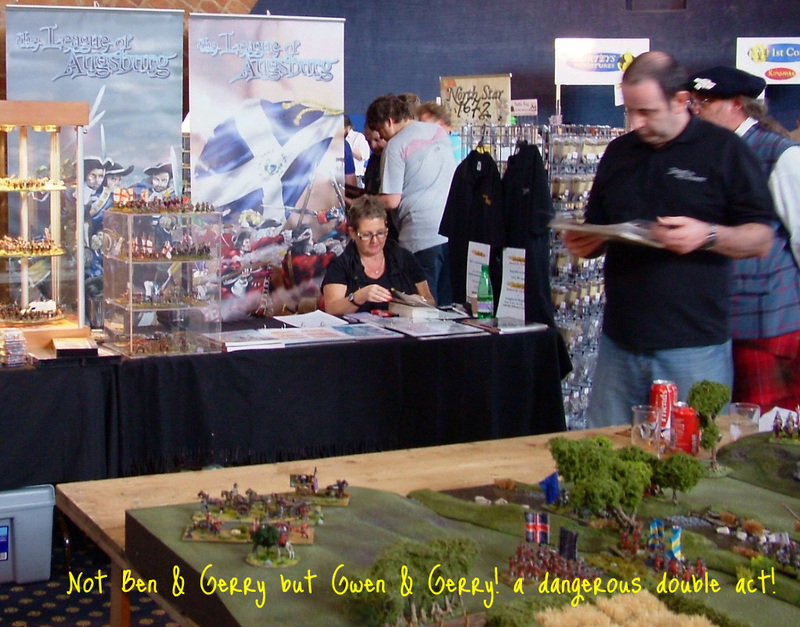 We had a busy set up with Toggy, Ade and Dave doing the table and Gerry, Gwen and I doing the Warfare trade stand adjacent to it. The LoA scenario was an Ireland 1691 affair on Ade's terrain with DOB, Gerry, Ade and Dave performing the honours at the table whilst I hoisted the Warfare banner with Gwen.The show appeared quieter from the get- go than May but as usual, the buzz was strong and of course we get to meet so many friends and acquaintances there. The LoA Amigos were kept very busy during the day talking to old friends and new period enthusiasts. Although our game was not strictly speaking a historical refight it was a credible encounter battle with Williamites and Jacobites fighting over a river crossing. What struck me was how many of the Warfare Miniatures on the table were not painted by me. 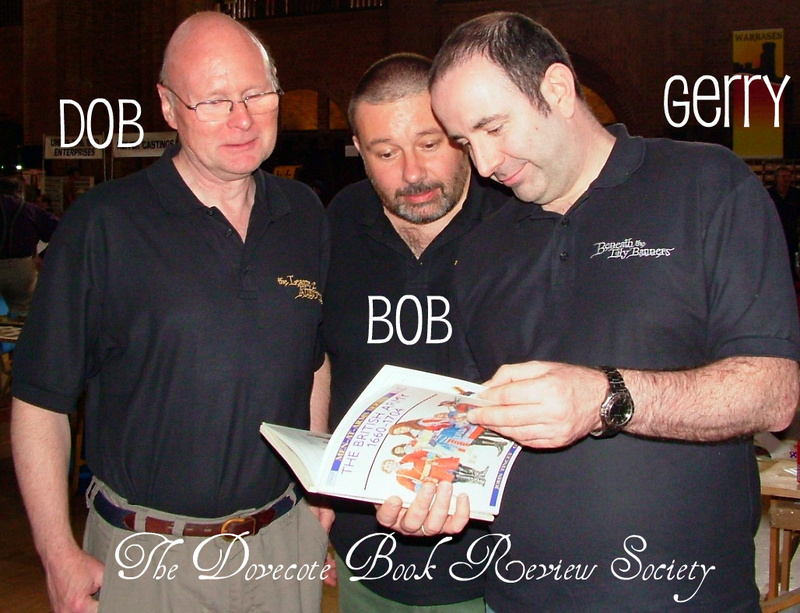 Bob and Dave particularly had between them about 500 models. Most of the flags were also from Quindia's super range. Warfare trade was steady all day and although slightly down on May it was a good overall outcome for us. We'd taken delivery that very morning of the new Gardes Francaises pikemen and the Dragoons in fur caps. We did fairly brisk trade in both. The GF command masters drew loads of attention and after the show they went directly to the casters for mastering. They should be commercially available this month. Shows appear to be a good place for flag sales and we managed to sell out of a few codes. At the shows we carry a limited stock of Ebor battalion packs. Ironically, the trader next door to us was the only other at the event carrying Ebor! I can't comment too much on the show itself as I got away from the trade stand twice and both of those journeys were calls of nature! I had five minutes with Nick Eyre at his very attractive 1670 table and we discussed some collaborative ideas. It was great to see the 'Old Team' of Maclean - Maxwell - Cummings back together if only briefly. It just struck me when I saw them that these three patriotic Englishmen have very Scottish names! I had a quick word with Mark Allen (He has a lot to answer for as it was his articles that first got me hooked on the period), Dave Andrews and Aly Morrison and the star of our blog Dan 'no autographs please' Faulconbridge. His interview piece here is the most popular post on the blog so far. As an aside, we'll have interviews with Henry Hyde(Editor of MW) and Nick Eyre (Proprietor of North Star) coming up over the coming weeks too. My blogging about Partizan was delayed by a week as after the show I immediately had to drive to Heathrow and head out to Croatia for a week of work. Just back last night so here is the (late) news. PS: Have you noticed in the pictures Gerry is always reading? But what?